Status: Paired with Legend. 2014: 1st nest failed during incubation (5 days). 2015: 1st nest failed during incubation (15 days). 2nd nest failed during incubation (9 days). 2016: Made 3 nesting attempts, all failed. 2017: One nesting attempt produced two chicks, one successfully fledged. 2018: 2 nesting attempts. The 1st failed at egg stage. The 2nd produced 1-2 chicks, one of which fledged. May 2011: Elle shares a May Day birthday with Trinny and has no sibling. It was the last of the first batch of transported eggs to hatch. Elle is a very nervous crane is scared of the aggressive cranes - particulalry Yellow Green (its neighbour). It generally forages alone from the group. 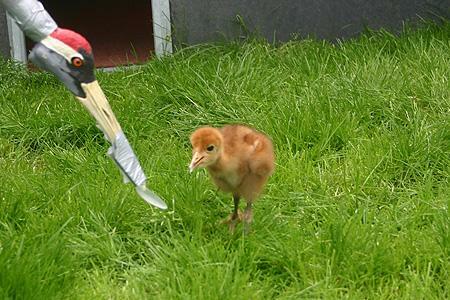 August 2011: Elle has grown into a stunning bird with very long legs with a beautiful gingery tinge to her feathers. She looks extremely graceful in flight.... and developed the nickname Elle in reference to Elle McPherson. 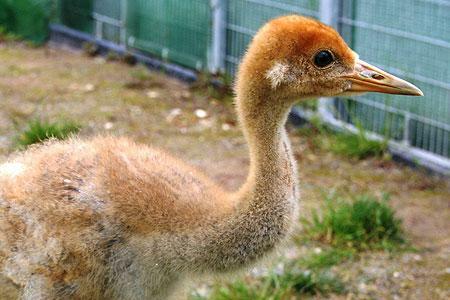 Elle really does have a super-model figure, and is one of the tallest cranes and is getting less scared of the others as she grows up! October 2011: Elle is a fine and well integrated member of the flock of mixed 2010 and 2011 birds that are regularly being seen out and about foraging across the Moors. September 2012: Elle has adapted well to life with the Somerset flock and she and her cohort are all behaving as naturally as any wild cranes. They have spent the summer feeding on the un-seasonally flooded grasslands of the Moors and Levels in small fragmented groups, but as autumn rolls in they are starting to flock again and follow the harvest, hoovering up any spilt and wasted grain. January 2014: Elle spent a lot of April and May 2013 in the company of the pair, Gilbert and Michaela on the Somerset Levels and Moors. She was frequently to be found 'hanging around' the pair, but Gilbert didn't seem too interested. The rest of the year was largely uneventful for Elle, spending the summer on West Sedgemoor, although she did fly up to Slimbridge along with a small group of birds in October, remaining for 28 days. The rest of the autumn was spent on Aller Moor and the Stoke ridge, and the winter very much as part of a tight-knit flock on Stanmoor, near Stoke-St.Gregory. We hope that she will pair up this year - perhaps with Gilbert... who knows!... but at 3 years old would still be quite young to make a breeding attempt. July 2015: Elle paired up with Legend (another 2011 year bird) in mid March - and the pair were seen frequently together on West Sedgemoor throughout March and into April. On 15th April the two birds were seen apparently incubating eggs, and continued to incubate for the next five days. However, in the morning of the 6th day they were off their nest and in the afternoon the site was visited to find it empty. We assume that something took the egg or eggs at night. The pair remained together and were seen mating again later in the month but no further nesting attempt was made. July 2015: Elle stayed on the Somerset Levels and Moors through the autumn and winter, and in early spring occupied a territory on West Sedgemoor with Legend. The pair began their incubation on 13th April and they incubated for 15 days before losing their clutch at night. They re-laid after a gap of 16 days on 14th May and this nest was incubated for the next 9 days until the pair were again seen off their nest first thing in the morning, and no longer incubating. Presumably they lost both their clutches to a nocturnal predator of some kind. February 2016: Elle spent the rest of the year in Somerset and overwintered with the main flock on the Levels and Moors. She is yet to be confirmed as paired up with Legend - but an unidentified pair were seen in their territory in late January and it seems likely that it is the same pair... but time will tell! July 16: Returned to last year’s territory on West Sedgemoor early in the New Year. 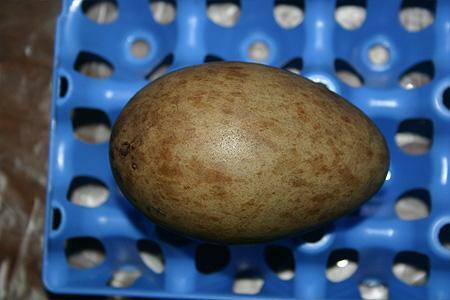 Incubation started on 4th April. Nest failed due to predation by either fox or badger. A 2 nd attempt was made in early May but failed after 8 days possibly predated by an otter. A 3 rd attempt - again in the same area – was predated by an otter after 14 days. Nov 17: Elle returned to last year’s territory on West Sedgemoor with Legend in February and they were seen there until the end of March. Though no nest building was observed, incubation started on 9th April and went full term with hatch taking place on 9th-10th May. Two chicks were confirmed on 14th May. The family were seen regularly ranging over a wide area to feed. Towards the end of June attempts to ring and radio tag either chick were made but were unsuccessful. On 7th July it was observed that only one chick was with the parents. The reason for the loss of a chick is unknown. The remaining chick has reached fledging age. Both Legend and Elle were incredibly elusive during chick rearing and it is thought that at least one of the adults was in moult this year. The family have now rejoined the flock. Sept 18: Paired with Legend and seen in their territory throughout February and March. Incubation thought to have started on 8th April but failed between 14th and 17th April. Back in their territory on 20th April they were sitting by 23rd April (although with a very different nest site location). Hatch occurred on 23rd May and the family remained close to the nest to feed but were well hidden dense vegetation. They were thought to have failed as they went ‘off the radar’ for a while during the summer - but they were seen with one nearly-fledged juvenile in August. The chick went on to fledge successfully.